Is Your HCM Platform Ready for the Gig Economy? Uber and Lyft dominate the news, but beneath the hype of gig platforms, the modern workforce is evolving. The percentage of workers who opt for freelance and contract work, temporary work, and on-call status grew by 66% from 2005 to 2015, while the number of employees working full time stagnated. The reasons for the shift are many and varied. Although it is hard to measure, most analysts agree that the 2009 recession and slow recovery had an effect, but other forces are at work. Automation of routine tasks has eliminated low-skilled jobs. At the other end of the spectrum, demand has increased for highly skilled workers. Some of the highest growth in gig employment is among older workers. As people in the 55+ age group retire or are displaced, many of them opt for freelance, contract, and consulting work. Displaced low-skilled workers can find it necessary to take part-time or on-call work to get back into the workforce. The contingent workforce is not monolithic. While freelance work has been a mainstay in creative work and entertainment, many other occupations are becoming more flexible, from service work to executives. Skilled workers often find they can have more flexibility, more control, and higher incomes by freelancing and consulting. Table 1 shows the fastest growing contingent occupations from a study commissioned by a 2015 RAND American Life Panel study. The growth of the contingent workforce creates benefits of flexibility, scalability and cost control to workforce management, but it brings much more complexity. Many companies are dealing with fragmented workforce management as business units independently handle contingent staffing needs. Risks increase as the contingent worker relationship is treated strictly as a financial transaction, without regard to engagement and development. The new workforce requires a unified approach to planning. We recommend a partnership between workforce planners and procurement. Procurement shines at air-tight contracts and risk management, and HR excels at welcoming and nurturing talent. A strong partnership will help you optimize the benefits and manage the risks. Bringing the many staffing models together will take close coordination and integration of several technologies. Onboarding, vendor management, and analytics each play a part, but these components must work together to optimize the value of your workforce. Onboarding. Contingent workers need onboarding, and the processes you use in your onboarding platform can easily be adapted to each worker type. The first considerations will be compliance and safety. You want to protect your firm and your workers by making sure they know the rules and behavioral norms. Engagement is just as important for non-traditional workers and for employees, and you will need to keep in mind that motivations for seeking independent work status are many and varied. Some workers choose freelance and contract work because they want freedom and independence. Others take part time work out of necessity. For some, their gig income is their sole support, but many are moonlighters, or they may have several part time jobs. Each worker segment will have its unique concerns. 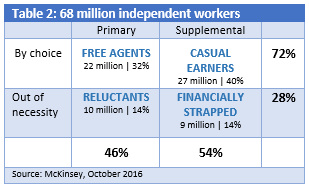 Table 2 shows the breakdown for U.S. independent workers from McKinsey Global Institute’s October 2016 independent work study. Vendor Management. Many vendor management systems (VMS) are on the market, but they are not the complete solution. Workforce planning, talent acquisition, and performance management demand a unified approach. It may include vendors, workers supplied by contractors, freelancers contracted through online platforms, and temporary or part-time positions your recruiting staff will handle. You may want to work with a managed services provider (MSP) for your staffing needs. Analytics. We recommend a unified approach to workforce analytics. Managing the costs, benefits, productivity and performance of the entire workforce demand side by side analysis of each staffing model. Give your managers the information they need to make the right decisions. The most successful companies will be those who can source, engage, and optimize the workforce of the 21st century. A unified, comprehensive strategy for managing a diverse workforce is the beginning. 1. Katz, Lawrence F. and Alan B. Krueger. "The Rise and Nature of Alternative Work Arrangements in the United States, 1995-2015. March 29, 2016. RAND American Life Panel. 2. “Is the gig economy a fleeting fad, or an enduring legacy?.” EY,. 2016. 3. "Independent Work: Choice, Necessity, and the Gig Economy." McKinsey Global Institute. October 2016. Previously: A New Employee Review Process Will Not Improve Performance Without the Main Ingredient Next up: Is Stealth Innovation the Answer to People Analytics?